QualitySilage.com: where latest information and technology concerning silage protection, harvesting and management is at your disposal. Our goal is simple: To provide farmers the educational tools they need to produce, store and maintain optimal silage for their livestock year after year. We are devoted to finding the solutions to silage challenges and sharing those solutions with you. 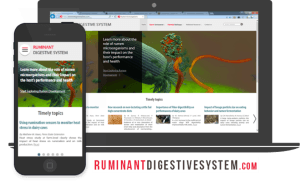 RuminantDigestiveSystem.com: Learn more about the role of rumen microorganisms and their impact on the host’s performance and health. The content aims at keeping you up to date with the latest information on rumen functions and microflora.